No one is exactly sure when Distillery Row was born… legend claims it was during a curious period known as “Old Portland.” Nonetheless we’ve always wanted a summer birthday so we just made it so. Join us—all eight distilleries—in the parking lot of House Spirits for a late summer extravaganza. 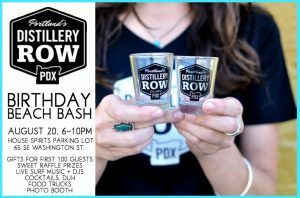 Music, food carts, and the best spirits and cocktails Old or New Portland has ever seen! Admission is free and grants you tastings, vibes, and all the selfies you can take. If you crave a cocktail, we’ve got those for sale (trust us, you crave…you crave big-time). Round things out with some nibbles from Koi Fusion and more and drop the mic on this summer!